Bought for a beach house. Nice “beachy” look. Good weight—not too heavy, not too light. Love it. A chic and refreshing update for any contemporary bedroom, the Mia quilt set from Laura Ashley is made from premium cotton fabric with unique quilting and a pleasant floral pattern in white and pale blue. Each set includes a pair of matching shams (one in twin size), and both the quilt and shams feature warm and weighty polyester fill. Conveniently machine washable and perfect for coastal inspired spaces, this excellent set will invigorate your home for years to come. Very happy with this quilt set. Very happy with this quilt set. Good quality. I was looking for a set that would go well in a beach condo with soft ocean hues & this was it. It goes well with wall shades of green, blue and even gray (used gray panels on windows) as there is a small grey accent through design. Sherwin Williams "Rainwashed" #6211 is what I used on the walls. Perfect, calming & relaxing. The color was a surprise; it's more of a seafoam a blue/green color not blue. It shrunk when washed, wish I would have gotten a king size instead of a queen. But with all that, it is a beautiful color! I am so pleased with the quality and beauty of this quilt and shams. The color matches my room perfectly. The weight of the quilt is perfect for summer and fall in the South. The delivery was quick and well packaged. 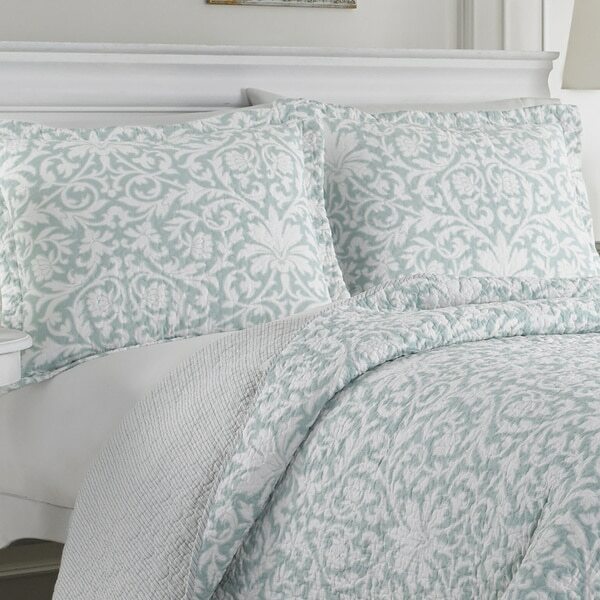 I highly recommend Overstock and this quilt set. If you want this quilt for a queen size bed buy a KING. It should be advertised FULL, not FULL/QUEEN. Washed it on delicate, cold water, hung it to dry. It is too short length and width wise, very disappointed. I gave it three stars because the quality of the material and pattern is excellent. I have a feeling that all Laura Ashley Quilts will have the same problem. The quality of the quilt and shams is excellent. The cotton is soft and smooth. The atmosphere in the room is fresh and airy. Love the set! This is a very nice quilt set, especially for the price paid. I found that the color description was accurate....I would describe it a a seafoam blue and white, and then the reverse adds the taupe color to it. Would definitely buy it again. This is a beautiful quilt, but shrinks a lot even on low settings. I bought the full / queen size for my queen sized bed, and as others have stated, the shrinking was excessive and it became too small. The good news is that I liked it enough to buy another in King size, which fits well after washing and drying. I have the smaller one folded at the bottom of the bed for colder nights. These layers are more comfortable for me than down. I love this bedspread, it is perfect for summer time. It is more green/turquoise as other reviews suggest - but still beautiful. The king was plenty big, but after washing it did shrink quite a bit. It still fits a king bed just without the excess I prefer. Very soft color, kind of a grayish teal. Based on other reviews I purchased a king for my queen bed which has both a thick mattress plus a foam topper. Glad I did as it hangs to about the length shown in the product photo. Of course, I forgot that I'd get king shams, which are too big for my pillows. Oops! Even prettier in person. Just the right weight for the summer months! I cannot give a review about the quality of this item because I never opened it. This is clearly a GREEN color, not blue. Overstock.com needs to fix this ASAP before more people are deceived. Lovely, Not quite a green, but good enough. Call it aqua instead of green. Love this set. use it for the guest bedroom. Very good quality for the price and has washed well. Blanket is thick but not too thick for Summer. Like that it has a pattern on both sides as well. The color is beautiful and it is a nice medium weight. Would recommend!! Very pretty. Not pastel like the photo though. Great quality quilt for the price. Bedspread and shams are a lovely fabric. A little more of a blue green shade than I expected, but very pretty. I was pleasantly surprised with how thick the spread is. I would recommend this! I love this quilt set. It is a thin quilt but I knew that when I ordered from reading other reviews. I did not want to sleep with it. I was going for a certain look & color. It worked perfectly. The bedding is really pretty. The color is true to the picture. My only reason for not giving it five stars is that it is quite thin, more so than most quilts. Great quilt, I liked the color, is brighter than the photo. After I washed and dried the quilt it did shrink some. Probably better to hang dry. Soft and light weight. I don't like a heavy quilt so this works well for us. Overall, happy with this product. I changed my decoration with this for a guest room. Nice fabric . Great quality quilt, beautiful subtle colors. Perfect lightweight summer quillt. Generously sized. "Will a full/queen size be available soon?" We restock items as they become available; however, we cannot guarantee an item will be restocked. If you would like to be notified when this item comes back into stock, please provide your email address in the box provided on the product page. "Is the actual measurement for a queen size 90" wide x 90" long? On another website it shows 90" long x 100" wide?" We do apologize for the confusion, the Queen is approximately 90 inches wide x 100 inches long. You better order the king size for a queen bed - it shrinks a fair amount in the dryer. I got the king for my queen bed & it's perfect with a fold-over at the top. I actually like that because it shows the contrast on the other side & is nice to have the extra "pull up around your shoulders" length at night. "Is this an aqua blue or a light blue?" Hello rhudjr1, the color is more of an aqua in my opinion. We try to represent the colors of our products accurately. Unfortunately, due to the difference in monitor colors we cannot guarantee that the color will match exactly what you see on your screen. Thank you for shopping with us. This is mostly a green. It is less blue aqua and more green aqua. Definitely more green hues than blue. "Hi, I was wondering if by any chance this comes in a king size?" Hello timbecky, we appreciate your inquiry. This bed is not available in a king size. We apologize for any inconvenience. We hope you have found this information helpful. Thank you for shopping with us! I am hoping it is green as it appears in the picture--and as the one review advised. "Hi Overstock, Is it really light blue? Or is it light green? In the picture it generally looks blue, but if I look closely, I could see how maybe it's green. Would you please confirm one way or the other? Thank you!" Hello WestChesterPA, this beautiful set features a blue and white. Thank you for shopping with us. "Regarding: Laura Ashley Mia Reversible 3-piece Cotton Quilt Set Is it possible to buy an extra sham with the purchase of a king quilt? A 3rd sham would make the pillows reach the width of the bed. Thank you"
Hello Ana, I hope you are having a great start to your day. I am sorry, but we do not have individual shams from this collection and are unable to sell parts of this set. Thank you for shopping with us and have a great day.